The French government through the French Agency for Development (FAD) will soon extend a concessional loan facility to Kenya to support local universities’ expansion projects. This project has been initiated and coordinated in partnership with the Ministry of Education, Science and Technology. The French Ambassador to Kenya, Mr Rémi Maréchaux noted that the rapid expansion of local universities requires heavy capital investment to ensure quality education and training is offered for Kenya to achieve its development plans. The ambassador made the remarks when he delivered a well-attended public lecture at TU-K on Friday December 4, 2015 with the theme: "Bilateral Relations Between Kenya and France". He said his government was planning a meeting in Paris for at least 8 university vice-chancellors from Kenya to meet with their counterparts from French universities to deliberate on possible areas of collaboration to share synergies. The ambassador extended the invitation to TU-K VC, Prof Francis Aduol to be part of the Kenyan delegation to Paris in March 2016. Mr Maréchaux also disclosed that TU-K Chancellor, Manu Chandaria, a while ago, challenged him to explain what France could do to improve capacity of Kenyan universities in training graduates with right industry skills. The envoy said his government will continue issuing scholarships to Kenyan universities’ members of staff and students to pursue advanced studies in various disciplines in line with an agreement recently signed with the Ministry of Education, Science and Technology.The partnership will make it possible for student exchange programmes between Kenyan and French universities to give them international exposure. Scholars from both Kenya and France will also engage in joint research projects that would be funded by French and Kenyan governments to advance knowledge (through the PAMOJA Hubert Curien Partnership). “The partnership between some of the best universities in France and Kenya will allow students from both countries to study in the host university for a short period, learn the culture, languages and overall gain global knowledge and skills,” said Maréchaux. Mr Maréchaux said France was keen in working with Kenya in the fight against terrorism as fronted by Al Shabab and Islamic State which have in the recent past carried out deadly attacks against innocent civilians in the two countries. The envoy denied that France had issued travel warning against its nationals after Garissa University College was attacked by members of Al Shabab in April 2015 in which more than 140 students were killed. He specified that the French Ministry of Foreign Affairs and International Development publishes and permanently updates travel advices for 192 countries all over the world. The travel advice concerning Kenya is easy to access on its official website and does not warn tourists against visiting Kenya. He said France was open to investors especially in the agricultural sector where Kenya would be having a comparative advantage. The envoy further noted that French companies with a presence in Kenya had increased from 32 three years ago to over 70 in 2015. “Some of the companies such as Lafarge, which produces Bamburi Cement has the Managing Director as the only expatriate while the rest of the staff are Kenyans. 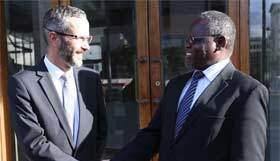 “We believe in giving a chance to Kenyans with the right skills to work in French-owned companies operating locally and internationally,” said Maréchaux. TU-K VC, Prof Francis Aduol thanked him for being the first-ever French ambassador to visit and deliver a public lecture at TU-K.